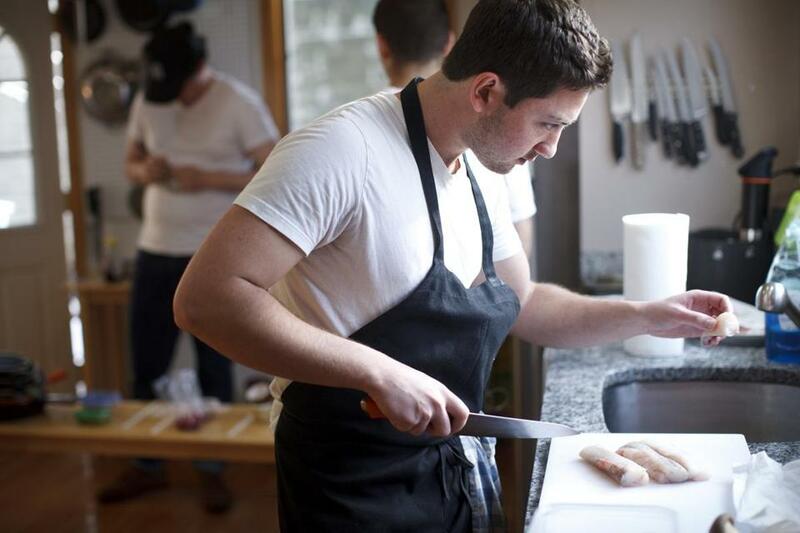 In his Somerville kitchen, Theo Friedman preps monkfish. 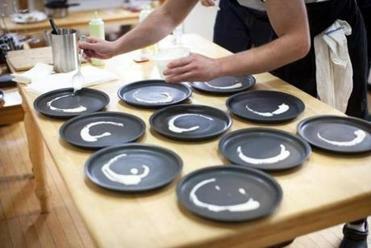 Friedman adds sauce to plates for another course. SOMERVILLE — Theo Friedman doesn’t dance to the salsa music playing in his kitchen. He’s too busy pouring liquid nitrogen onto carrot panna cotta. Friedman, 21, who will graduate from Tufts University Sunday with a degree in American Studies, is spending a Saturday in April with friends and custard. His makeshift kitchen crew of fellow Tufts students watches him pour the tasteless liquid chemical onto a tray of silicone molds to release the orange custards. Steam rolls onto the floor, making the place look like something out of a Michael Jackson music video. 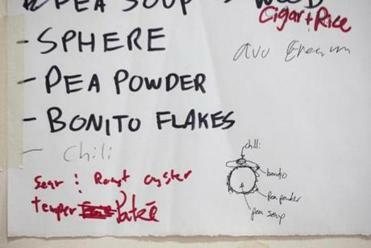 For four months, the amateur chef has been planning a 20-course menu to illustrate how the industrial food system disconnects diners from the people who make their food. He is preparing the dinner with a $350 grant from the Tufts Undergraduate Research Fund and is writing a paper on the subject. The menu uses sustainable practices (for instance, rather than goose liver, his “foie gras” is made with trumpet mushrooms), and represents his own experiences (some dishes are served on wood from his childhood home in the Berkshires). Friedman’s lists detailing each course. Twenty-four hours later, the long table is set, Mason jars at each place. “Guys, we’re half an hour out,” Friedman calls to his assistants. “Heard,” Ben Silver replies. Silver, a junior, has little kitchen experience, which makes him a bit of an outlier. The sous chef, so to speak, is sophomore Ryan Johnson, 19, who cooked at La Condesa in Austin, Texas. Also in house is Catherine Caffey, a junior, who worked at the Nashville bakery The Frosted Affair. Kitchen jokester Jack Watterson, 21, was a line cook at a Colorado dude ranch. 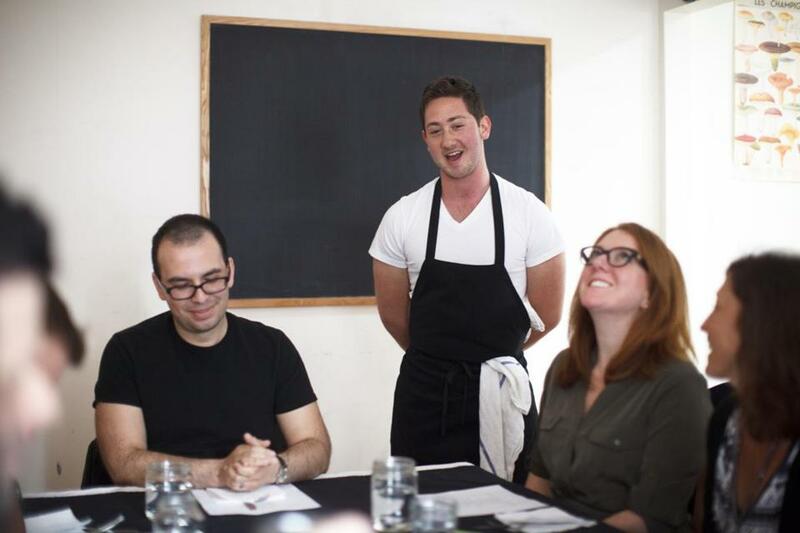 The crew has helped Friedman at other dinners, (an eight-course pop-up, a 13-course pop-up, a taco night or two). A mushroom dish is served on a piece of wood from Friedman’s childhood home in the Berkshires. 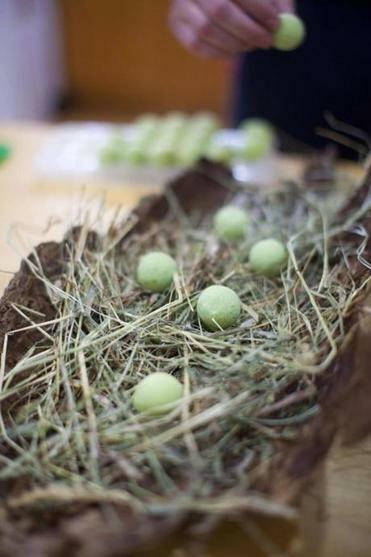 A pea soup course was served on hay. In the silent kitchen, Friedman spots Silver breaking apart a beet meringue, which isn’t really a meringue, but something crackerlike. The cook speeds him along: “Ben, man, you gotta get that going.” Friedman is obsessively organized. A mise en place is divided with masking tape, each course separated into columns with labeled tubs. Minutes before the dinner begins, Friedman thanks his crew. “Let’s have a great service.” He puts in a fist, Johnson pounds it. The makeshift dining room fills with members of the food community: Judy Gelman, a Needham cookbook author (see related story), joins restaurant consultant Aleen Saraceno and Indonesian caterer Retno Pratiwi of Kaki Lima. At the heads of the table sit Tufts project advisers Alex Blanchette, assistant professor of anthropology, and Noe Montez, assistant professor of drama and dance. The first course is chilled green pea soup, which arrives in the form of a round bonbon topped with green chile and bonito flake, and dusted in a powder made from dehydrated peas. The shell, a mixture of cocoa butter and white chocolate, melts in the mouth. Servers place smoking ceramic dishes, which hold burning wood, at both ends of the table, the scent intended to “transport us to the forest,” Friedman explains. Somerville resident Pep Vicente leans in. 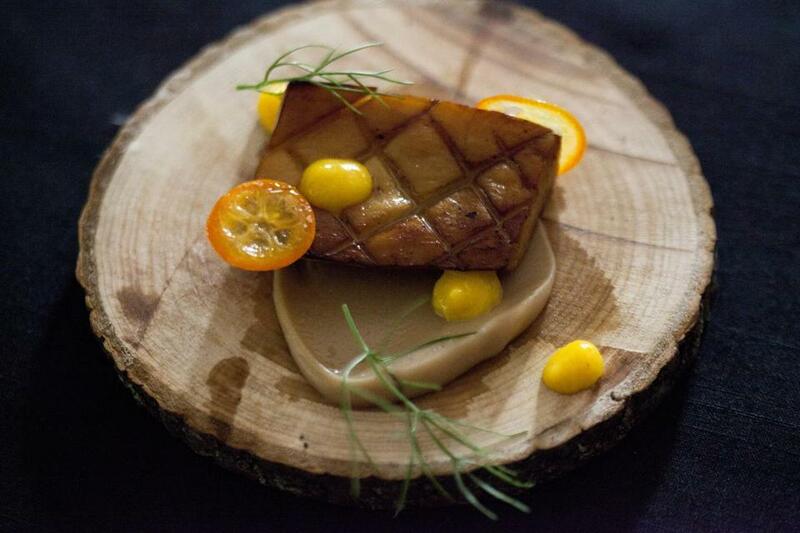 “That smell is so strong, it reminds me of campfires.” Later, a trumpet mushroom, scored and pan-roasted to look like foie gras, arrives on a circle of wood, with a chestnut-oolong puree, slivers of kumquat, a puree of pickled kumquat, and a fennel frond. Theo Friedman (standing) greeted guests at his dinner, which was funded by a Tufts Undergraduate Research Fund grant. Salmon skin chicharrones are “a play on fish and chips,” says the cook. They are served with an avocado crema. They sound extravagant but taste like Lay’s; each silvery stick is dusted in lemon and malt powder, to mimic a squeeze of citrus and splash of vinegar. As the night comes to an end, Friedman is all smiles. For dessert, guests are given chocolate bars filled with chicken liver pate, then three more sweets, then an espresso cup of rich chocolate ice cream drizzled with olive oil and sprinkled with lavender, beet-raspberry powder, and sea salt. And finally, cups of peppermint tea. The host is relaxed and beams as guests applaud. It’s almost time to graduate. Cook a 20-course dinner. Check. Write a paper. To do. Pick up cap and gown. Whenever. Brooke Jackson-Glidden can be reached at b.jackson-glidden@globe.com. Follow her on Twitter @jacksonglidden.